You are never too old to fall in love and to get married. There are many stars in Bollywood who got married after they turned 40 years of age. Some of them are celebrities who married after 50. These are all people who prove that when it comes to love and marriage, age is just a number. In fact, these include some people who had waited for years while dating to get married and even some who had never thought about marriage until something came up in their lives. 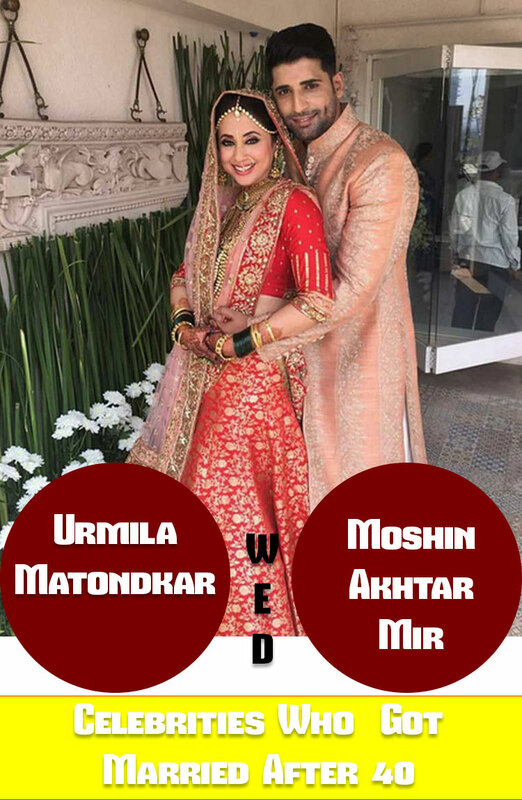 Many had been following Urmila Matondkar and her exploits with Ram Gopal Varma, but the actress tied the knot at 42 with someone else. She stuck with Moshin Akhtar Mir, a prominent businessman and model, for her husband. Like with many other celebrities, she had a secret ceremony that was revealed to the public on social media. The interesting thing about Urmila’s marriage is that it was rather surprising. Although people loved to follow her on social media to see what she and Moshin were doing, their marriage ended up being very surprising. It took the media by surprise throughout India. Lisa Ray has been a growing name in Bollywood, but it would not be until she was 40 when she got married to Jason Dehni, a popular management consultant who works with many Bollywood stars. Ray stated that she was glad that she did not get married at a younger age as she felt a marriage too soon might have been a mistake. She proves that sometimes it is best to wait for a bit before getting married. MUST READ Signs He Hates You After A Breakup? 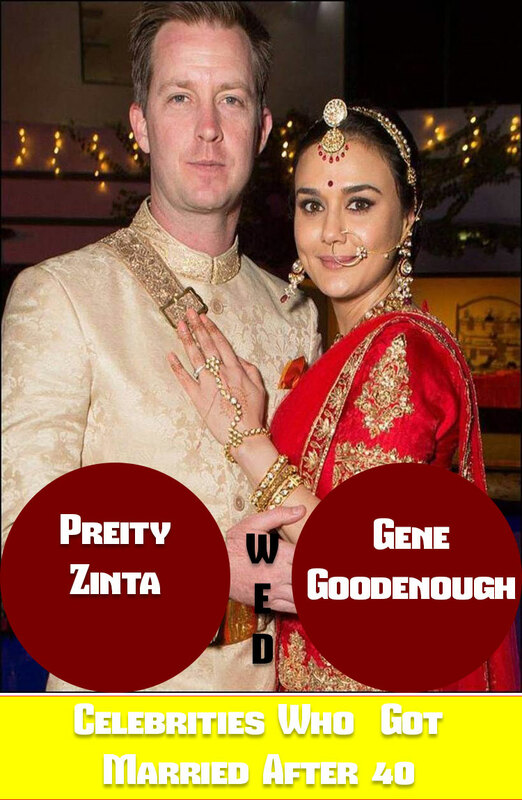 Preity Zinta had not held much of an interested in getting married, but the actress decided to get married late in the game because her mother felt it would be the right thing for her to do. At 41, she married Gene Goodenough. The couple got married in 2016 in Los Angeles, where Goodenough is originally from, instead of somewhere a little closer to home in India. John Abraham has become one of the hottest studs in the Indian acting world, but he waited until he was 41 to get married. He fell for Priya Runchal, a popular investment banker, and soon after they got married. What’s interesting about this is that Abraham was able to keep this private until he posted a message on social media about his wedding. The next of our celebrities who married over 40 is about someone’s second marriage. Aamir Khan was 45 when he got married to his second wife, Kiran Rao. He figured that there’s nothing wrong with trying again, and no one can really argue with him about it. Saif Ali Khan looked to find love after first marriage fell apart in 2004. He dated Rosa Catalano for a period, but it is still unclear as to why their relationship ended so suddenly. But Saif Ali Khan had a happy ending in 2012 when he got married at 41 to Kareena Kapoor. The two had been dating for nearly four years before they finally decided to tie the knot. MUST READ How to Deal With Workplace Harassment? Boney Kapoor had not originally planned to marry Sridevi. But the two Bollywood stars would eventually get hitched when Kapoor was 40 years old in 1996. They got married after Sridevi became pregnant. He felt it was the right thing to do for her. Some Indian celebrities who married late are ones who married very young. Sanjay Dutt is one such example. He was 49 years of age when he married Manyata in 2008. She was 30 years of age at the time. 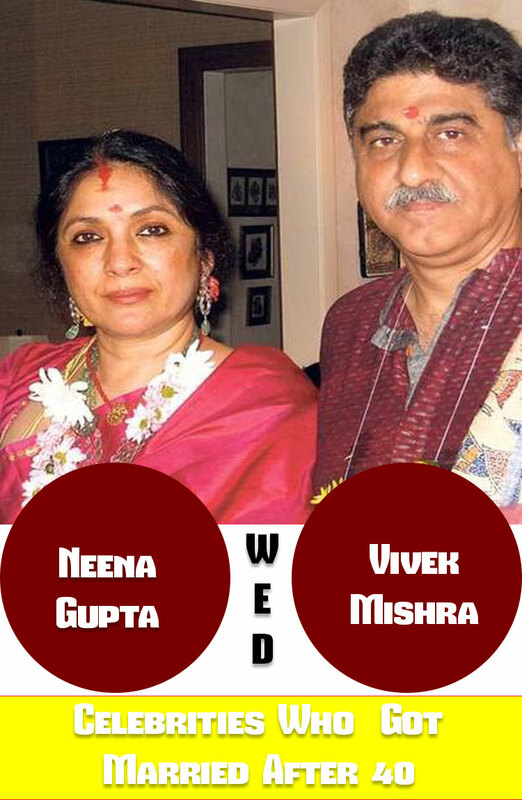 Neena Gupta had been struggling with love for years. She dated Alok Nath for a while and was engaged with Shaarangdev for a bit, but the wedding was canceled. Even worse, it was Shaarangdev who called it off. Gupta also had a daughter in her relationship with Caption Richard, but even then she could not tie the knot with him. But in 2008, Gupta finally found the love she had been missing. She was 48 when she married Vivek Mishra. The two actually met each other six years earlier. They went out to the United States to get married. In fact, Mishra proposed to her while in the United States and would get married just a few moments after that. It proves that while Gupta had struggled to find love for so long, she would eventually get it once and for all. Popular filmmaker Aditya Chopra was 42 when he married actress Rani Mukherjee. The two of them did take their time when getting married; they were dating for about three years before getting hitched. If they had dated any longer, Rani could have been included on this list. She was 35 when they got married. While there are many great stars who got married after 40, there are also plenty of celebrities who married after 50 that deserve to be noted. Kabir Bedi is one such star. On 2016, Bedi turned 70 years of age and married Parveen Dusanj. This was Bedi’s fourth marriage. This did have some controversy attached to it as Bedi and his daughter Pooja Bedi were in a very rough patch in their relationship. Not Bollywood actors who married late are ones that married people significantly younger or older than they are. Suhasini Mulay is a good example of this. 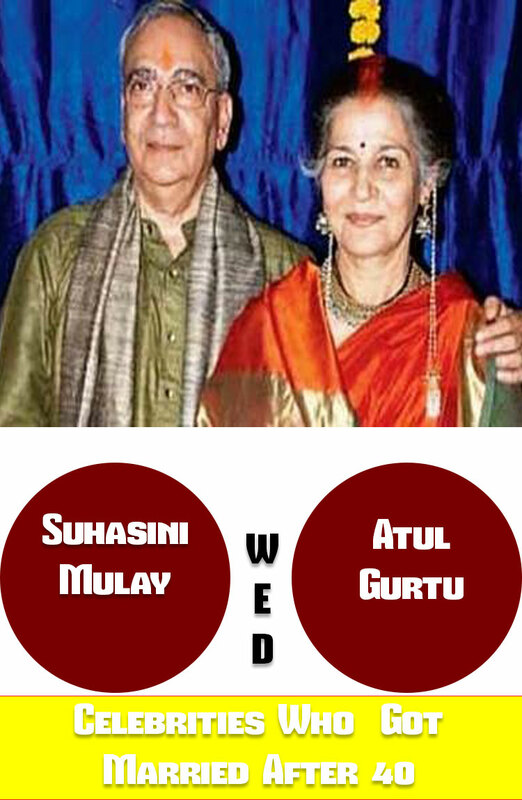 The actress was 60 when she married Atul Gurtu, a man only five years her senior. So, what can all these couples teach us? They prove that there is nothing wrong with waiting to get married. If anything, it might be best to wait because there is always time to get a little more experience with love before getting married. All of these couples are great ones who show what love is truly all about.